There was yoga of different styles, silent meditation and Kirtan singing, philosophical teachings and thoughts, avtive-noisy days and completely silent ones. 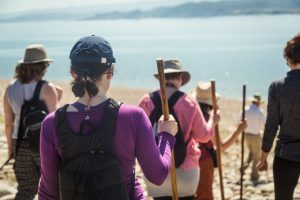 These always came together with other activities – forest walks down to the lake, where we swam surrounded by all that beauty that is the Maharaja Pratab Sagar and the Himalayas beyond. What bliss! Long walks into nearby villages, meeting welcoming locals, who very kindly invited us into their homes. A hot cup of sweet chai, and we were then rowed back to shore by the local fishermen, in their little boats. A pile of nets in the corner of the boats served as a reminder of their task for the night to come. 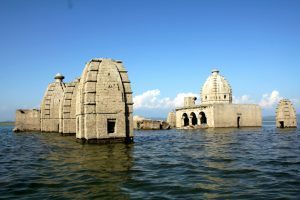 Visited the 8th century Bathu Temples, protruding out of the lake water in April, experiencing some special moments. Beautiful giant egg shaped structures, pleasing symmetries in the soft afternoon light; and the wheat ripening in the surrounding fields, soft yellows and lime greens, intertwined with the blue of the waters. Monica Voss, Scaravelli inspired yoga all the way from Canada with lots of repeats, lots of fun, swims, walks, bird watching and Talwara visits ! and there was Monica, and there were her yogis and that magical trek to Barot, of course ! Monica returns to Basunti twice yearly, the staff are always delighted. 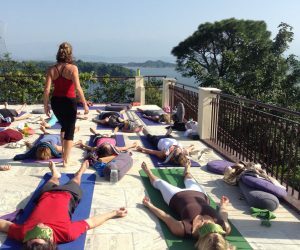 Clare Kerrigan and her lovely yogis spent 8 days with us in march 2018 for the first time. We loved having them here and hope they enjoyed their stay. 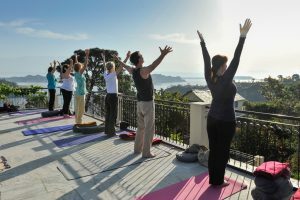 Followed by Duncan Hulin and Andrea Guest from the Devon School of Yoga. As always, 14 blissful days of Hatha, kirtan, meditation and teaching. Duncan and Andrea return to Basunti at least once every year, and the staff here enjoy looking after their groups. Familiarity that breeds love, embracing fun, laughter and joy. Bridget Woods Kramer was to follow with her group of yogis, practicing Anusara Yoga. They were beginners, experienced and old comers all united by Bridget’s spirit. A magical visit to the Bathu Temples, just bobbing out of the lake waters. Bridget too, is a yearly visitor to Basunti, and by now she is part of our little world. A village wedding in the heat…we did not want to miss it, nevertheless. And of course the trek! let us not omit to mention the trekkers !! 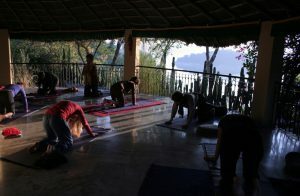 Joyce McMiken and Marcos Rodriguez joined Basunti last year for the first time and together with Arvind Pare of Mysore, we had 10 wonderful days of Ashtanga and restorative yoga coupled with philosophical teachings; Bliss. And last but not least is Bristol Maryott, all the way from the US of A, teaching Jivamukti and Ashtanga yoga. Bristol too is part of our growing family of yogis and it is always a pleasure to look forward to her return. Thanks again everyone from all of us at Basunti. It has been a real pleasure having you here and yes, no doubt, we couldn’t do any of it without you.